Cooking in Shanghai can be difficult. You are surrounded by restaurants, dinner dates, and then there is Sherpas, the website the delivers food right to you door! But why is cooking in Shanghai difficult? I mean even the groceries get delivered to your door. The past few weeks I was selected to participate in a trial group for the app Sidechef. Sidechef is a step by step cooking app with loads of recipes and drinks. The app is great and easy to use, even my boyfriend was able to create some salmon burgers with it! I loved the app because it got me out of my cooking rut and gave me new recipes to pick from! So what did I make? I started with yellow curry! First of all, why have I never made curry before? This curry was so easy to make and tasted amazing! I used a pre-made curry paste to save on time and ingredients, the rest was chop and simmer! The big mistake I made was using purple potatoes! Note: Purple and Yellow do not mix well together, add shrimp and you get all kinds of strange colors! Thankfully it tasted good! 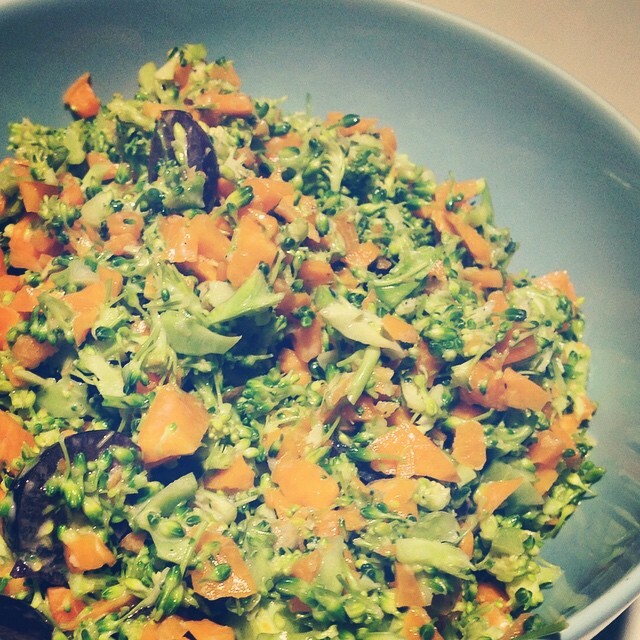 I then tried and failed to make a “healthy” broccoli salad. I finely chopped broccoli, carrots, and cauliflower. Added mushrooms and almonds. My mistake was not measuring or following directions on the dressing. I added the juice of 1 lemon, random assortments of spices (mostly garlic pepper) And then thought it would be a good idea to add greek yogurt! Another meal I made was roast beef with Spaghetti squash. Since we don’t have a microwave, I made Jason machete the squash before roasting it. I put a little olive oil and garlic pepper on the squash and threw it in the oven for about 30 min. For the beef cubes, I sautéed 1 onion and slow cooked the beef with some Olive Oil and of course….garlic! I over cooked the beef but it still tasted yummy! The 2nd week, Jason cooked for us! I found a recipe for him to use and he made salmon burgers. I thougth they tasted great, but Jason didn’t think so. From what Jason said, they were easy to make. Thankfully, I wasn’t around while he was cooking. I can be a little intense in the kitchen! The next week, the menu included Stuffed mushrooms and vegetarian chili. Both of these things are really easy to make and taste delicious! I made the mushrooms on Friday as an after school snack/light dinner! For my chili I use lots and lots of veggies. I start with onion, garlic, and peppers. 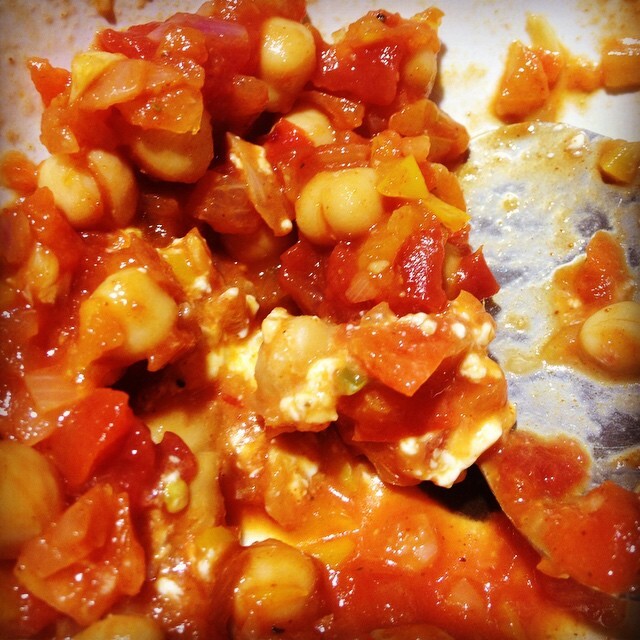 Then I add diced tomatoes, beans, and chick peas. Add chili, some cumin and you’re good to go. I let this simmer for awhile and then if I have it on hand I”ll add cheese. This past weekend, I made egg casserole. This always reminds me of home and again it’s so easy to make. I’ve been on a big red and yellow pepper kick so I made sure to add those to the egg bake. I also felt it was a good time to clean out the fridge. I found some hashbrowns in the freezer and had left over turkey. Through it all together and you have a delicious egg bake! I think the turkey made it taste like a tater-tot casserole….but either way it was delicious! See mom! I do cook at home! And as always, it’s fun to cook at home. Let’s hope I can keep it up during the holidays!